A look at Bridgestone's new guayule center in Mesa, Ariz.
MESA, Ariz.—A 30-year-old prototype truck tire, made entirely from guayule rubber, sits in a prominent place in the reception area of the Bridgestone Biorubber Process Research Center in Mesa. The presence of this weathered tire stresses the continuation of innovation that began with Firestone Tire & Rubber Co., predecessor of Bridgestone Americas, and continues through the opening of the Mesa center, a state-of-the-art facility dedicated to research and development in guayule as a commercial natural rubber crop. “The rubber industry has reached a critical juncture,” said Bill Niaura, director of new business development for Bridgestone Americas, at the Sept. 22 ribbon-cutting ceremony that officially opened the 10-acre guayule research, development and pilot processing complex. The new center includes a single-story, 8,300-sq.-ft. office and laboratory building; a 3,500-sq.-ft. shrub prep building; a two-level, 5,500-sq.-ft. building for rubber extraction, co-products and solvent recycling; and a 3,100 sq.-ft. mechanical and electrical building. With 97 percent of the world's natural rubber coming from Hevea brasiliensis trees in Southeast Asia, the need for biodiversity and a domestic U.S. source for NR is greater than ever, according to Niaura. 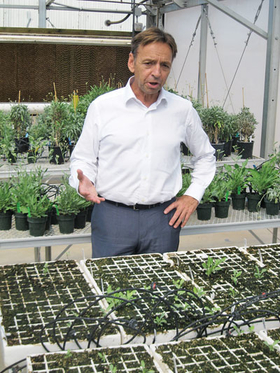 “Guayule could be a game-changer for the industry,” he said. Other speakers at the ceremony included Yoshi-yuki Morimoto, senior vice president and chief technology officer for Bridgestone Corp.; Asahiko “Duke” Nishiyama, executive chairman of the board for Bridgestone Corp.; Arizona Secretary of State Ken Bennett; Rep. Matt Salmon, R-Ariz.; and Mesa Mayor John Giles. The center operates in close collaboration with Bridgestone's 281-acre Agro Operation Guayule Research Farm in Eloy, Ariz. Both operations employ a total of 30, according to Niaura. Bridgestone did not make public the amount it has invested in those operations. The Mesa center and the Eloy farm are part of the research initiative Bridgestone announced in 2011 to diversify the world's NR supply, according to company publicity. That initiative in turn is part of Bridgestone's long-term vision of manufacturing products from fully renewable and sustainable raw materials by 2050, it said. Dave Diering, director of the Argo Operation Guayule Research Farm in Eloy, Ariz. shows off a guayule seedling ready to be transplanted. The effort to commercialize guayule goes back more than a century, when small businesses along the Rio Grande on the Mexico-Texas border sprung up to extract NR from guayule. However, those businesses failed after they had exhausted the supply of wild guayule plants in the area. Not only that, but they destroyed important cultivars that set guayule back for many years, according to Dave Dierig, director of the Agro Operation Guayule Research Farm. During World War II, the federal government funded the Emergency Rubber Project in response to Japan cutting off NR supplies to the U.S. ERP agronomists were successful in planting thousands of acres of guayule and extracting high-quality rubber from it; however, once the war ended, the government had the guayule plants destroyed. In the face of spiraling oil and synthetic rubber prices in the 1970s, Congress passed a law in 1978 mandating the creation of a domestic guayule rubber industry. In the 1980s, Firestone designed and built a pilot guayule processing plant for the project, which was centered at Sacaton, Ariz. 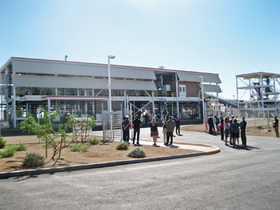 Results were encouraging, but for various reasons the Sacaton project ended. “Half the rubber from Sacaton went to Firestone to make truck tires, and half of it went to Goodyear to build nose gear tires for the F-16 fighter plane,” Niaura said. Bridgestone learned a great deal from Firestone's experiences of three decades ago, he said. But meanwhile both the agronomy and the technology have advanced tremendously over that time, he said. The company broke ground on the Mesa research center in late May of 2013, according to Niaura. While guayule fits perfectly into Bridgestone's biodiversity and sustainability goals, those things are not enough to make guayule viable, he said. Bagasse—a term borrowed from the sugar cane industry—is the woody part of the guayule shrub, and it has several possible applications, according to Niaura. “You can take bagasse and make briquettes from it,” he said. Guayule briquettes are low-sulfur and carbon-neutral, but also relatively low-return, he said. Through pyrolysis or fermentation, higher-value applications for bagasse are possible, Niaura said. These might include bio-char for soil filtration, boiler fuel, or even low-grade bio-oil, gasoline or diesel fuel. 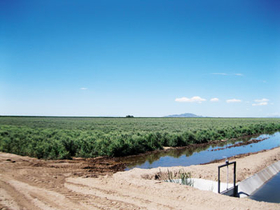 A look at Bridgestone's guayule plantation in Arizona. Guayule is a challenging plant to grow and cultivate, because of its abnormalities, according to Dierig. “Certain guayule plants are diploids, which means they reproduce in the normal, sexual way,” he said. “But others can have four, five, six, even eight sets of chromosomes, and they have clone-type reproduction. You can't tell just by looking at them which is which. “This creates complications in breeding the plant, because you can only cross-pollinate with diploids,” Dierig said. Up to now guayule has only been planted by transplanting seedlings, according to Dierig. This is expensive—three or four cents per seedling—which is why much of the research at the farm in Eloy is concentrating on direct seeding, he said. “You can harvest a guayule plant in three years, but we hope to get it down to two,” he said. Besides improving guayule genetics, developing best growing practices and providing biomass for the Mesa center, Dierig and his team on the Eloy farm are in contact with local farmers to develop working relationships that will lead to their taking on guayule as a cash crop, he said. Meanwhile, the Mesa center expects to produce its first samples of guayule rubber this fall, with pilot-scale production beginning in early 2015. “We're talking tens of pounds of rubber per day, not hundreds or thousands,” Niaura said. Bridgestone plans further scaling-up of the pilot plant in 2016, on the way to planned full commercialization of guayule in the early 2020s, he said.